Arathi wants to help people. Her future goals include becoming a social worker so that one day she can help girls in a similar situation to hers. 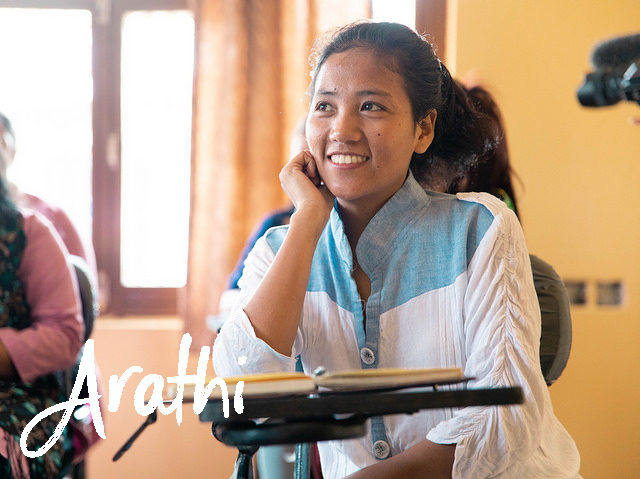 Arathi is one of eight girls currently enrolled in a six-month leadership training school. We see in her infinite potential and the brightest of futures, but despite her radiant smile and can-do attitude, Arathi has lived a difficult sixteen years. She’s experienced rejection, abandonment, and despair. When she tells her story, she always starts at the beginning, “While I was in my mother's womb, my father did not accept me as his daughter and divorced my mother.” His rejection followed her — a shadow she couldn’t shake. Then, her depressed mother passed away from cancer. Her older brother neglected to care for her. Her aunt and uncle abused her. And so, alone and despairing, she ran away — more than once. Finally, attempting to cross the border between Nepal and India, she was taken aside by a staff member of a partner organization, and warned about the dangers of human trafficking. Having no home to return to, Arathi was brought to a safe house where she is learning skills, continuing her education, and becoming the leader she was meant to be. She finally has the chance to thrive.